James Joyce famously said that he was happy to go down in history as “the cut-and-paste man”, and perhaps no other writer is so promiscuous with references and allusions. But whatever his flirtations with Shakespeare or Homer, he was always going steady with Dante. Dante Alighieri, author of the Divine Comedy (the epic poem in which the poet himself journeys through Hell, Purgatory and Heaven) was Joyce’s all-time literary crush, and no matter how unique Finnegans Wake might appear, almost every important element of its design has a logical antecedent in the work of the 14th Century poet. For example, take the eccentrically detailed use Joyce makes of his own autobiography. Not only does he detail obsessively the geography and society of his hometown of Dublin and the people he knew, he includes references to people and events that only close friends and relations of the author could possibly understand. Ideas he had for books he had in adolescence, stories his father used to tell, his predilection for women’s underwear... That’s a pretty weird thing to do by any standards, but I’ve no doubt that Joyce took courage in his decision from Dante’s choice to fill his work with references to Florentine politics, meetings with deceased Florentine historical figures and old friends, and even to personal aspects of his own life: for example, his status as a political exile, and most importantly, his love for Beatrice Portinari, a Florentine woman who became Dante’s Dulcinea, an idealised representation first of courtly and finally of divine love. Even the most difficult aspect of the Wake, its language, can be illuminated somewhat by the Comedy. In Dante’s Italy, Latin was still used as the common written language. But Dante believed that a standard vernacular Italian could replace Latin as the language of poetry in Italy. Unfortunately, standard Italian did not exist, so Dante had to invent it. The Comedy was composed in a combination of Italian dialects from across the peninsula. Obviously, when Joyce decided to combine however many dozens of dialects and languages to create the language of the Wake, his intention was not to create a new standard dialect of English. But he surely had in mind those Medieval Italians who read Dante’s work for the first time and discovered there a new language, equally familiar and unfamiliar to all. But it’s in the content of the two works that the most interesting similarities lie. Dante’s poem describes a literal journey into the Underworld, but that setting is only the pretext for an exploration of the spiritual struggle with sin and the quest for moral purity. Joyce’s book describes a figurative journey into the “underworld” of a dream, but its true subject is the emotional conflict of the individual psyche. The question of allegory takes us to Dante’s theory of poetics, which was based on Biblical scholarship in the Middle Ages. Medieval theologians interpreted the Bible on four levels of allegorical meaning: the literal, the typological (an allegory to the story of Jesus), the tropological (a moral rule for everyday life), and the anagogical (related to the nature of the Afterlife). Church doctrine taught that these allegorical meanings were the result of divine inspiration, but Dante thought that poets should imitate the system, composing their work with three layers of allegory concealed within. So the Comedy is at once the literal story of Dante’s pilgrimage, an allegory for the death and resurrection of Jesus, a detailed exploration of the nature of sin and virtue, and complete geography of the Afterlife. When Joyce adapted this system for Ulysses, he did so in a fairly clear and similarly hierarchical fashion. 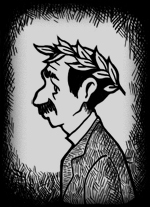 The story of Leopold Bloom is at once a vividly literal portrayal of turn-of-the-century Dublin life and an allegory for the story of Odysseus. But in Finnegans Wake the system explodes. There is no literal layer at all, only a shifting series of varyingly coherent scenarios from which allegorical senses erupt in every direction (of which the most mysterious is ironically the most mundane: the identities of the dreamer and his family). In the Wake, a Medieval love of ordered systems and hierarchical lists collides with a very modern loss of trust in their validity. At the centre of the Comedy lies God. At the centre of the Wake lies the chaos of a mind at war with itself. It is Dante’s natural post-Freudian heir. Excellent! Send me a copy!